The World Bank, in its latest “Malaysia Economic Monitor” report (June 2018) said that Malaysian consumers are paying a “considerably” high price for fixed broadband service, compared to other countries with similar level of economic development. World Bank said prices of fixed broadband service are high in the country because Telekom Malaysia does not share its cable landing station with other operators. TM chargers a high fee for point-of-access connection outside these cable landing station, resulting in costly broadband rollout for other ISPs. Apart from these, the HSBB and SUBB project were given to TM exclusively without contest, “eventually eliminates the possibility of attracting private investment,” it said. Malaysia has made significant progress towards establishing the foundations for digital connectivity and closing the gaps in basic internet access. By 2016, almost 80 percent of Malaysians had access to the internet, a level comparable to that in many advanced economies, including Australia, Japan and Republic of Korea. 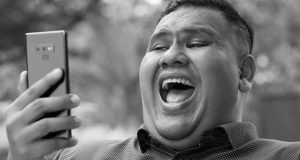 In Malaysia, the expansion of access to the Internet is largely the result of the uptake of mobile services, which is the preferred means of accessing the Internet. In Q1 2017, Malaysia’s mobile broadband subscribers for 3G and 4G networks has reached 118 percent of the total population, with this high proportion largely attributable to the widespread deployment of affordable smartphones and the expansion of 3G/4G networks. However, when it comes to the level of adoption of fixed broadband services, Malaysia lags behind other countries at a similar level of economic development, with limited use of fiber optic broadband services. Available data indicates that only about eight percent of Malaysian households use fiber broadband services, with a slow growth rate. 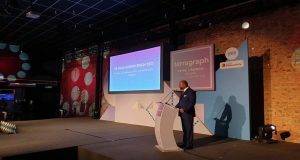 By comparison, the rate of adoption of these services in Singapore, Republic of Korea and Japan stands at 99 percent, 85 percent and 60 percent respectively. A major constraint on higher levels of adoption in Malaysia is the high cost of these services. The cost of these services remains high despite Malaysia having had one of the highest per capita levels of private investment in telecommunications in the region since 2010. Malaysian consumers pay considerably more for high-speed broadband access than consumers in other countries. While Malaysia has made significant progress in terms of facilitating affordable access to mobile internet services, the cost of access to highspeed broadband services is relatively high compared to other countries. In terms of price per Mbps, Malaysia ranks 74 out of 167 countries for fixed broadband services and 64 out of 118 for fiber broadband services. This places it behind regional comparators such as Vietnam and countries at a similar level of economic development such as Mexico and Turkey. The high cost of fixed broadband internet services is partly driven by limited competition in the fixed broadband market. Relative to other countries, Malaysia’s fixed broadband market is much more concentrated than is the case for mobile services in Malaysia. 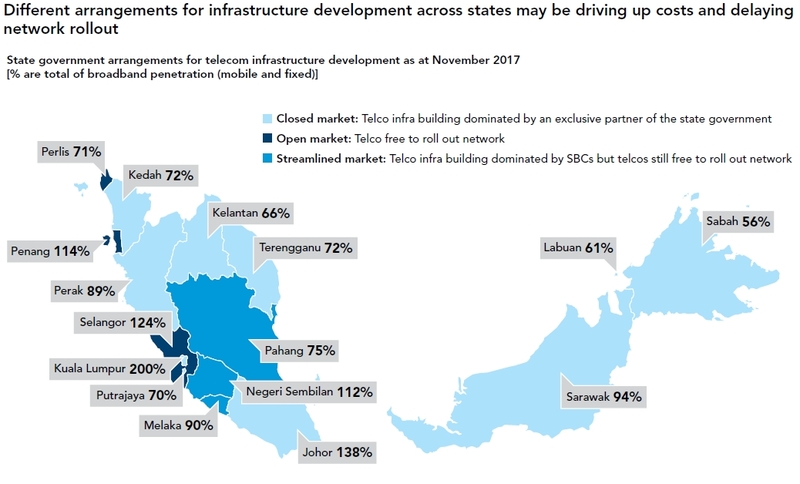 In Malaysia, Telekom Malaysia (TM), the leading fixed broadband service provider, as a significantly larger market share than the leading firms in other countries. 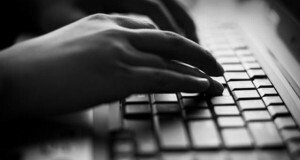 The limited competition contributes to the higher fixed broadband prices in three ways. 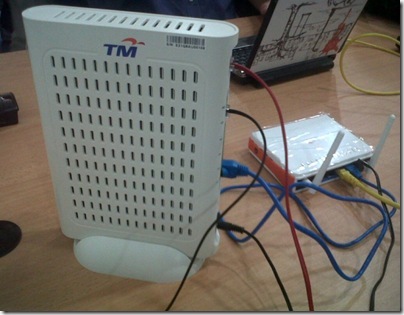 First, while TM is the major incumbent of cable landing stations in Malaysia, rather than allowing for co-location of its stations with other operators, it instead provides point-of-access connection outside the stations and charges a higher fee, which translates to a higher cost of broadband rollout. Second, given TM’s extensive broadband networks, it has been awarded exclusive memorandums of understanding with the government to deploy the high-speed broadband (HSBB) and sub-urban broadband (SUBB) plans, without contest. This eventually eliminates the possibility of attracting private investment by the network rollout operations. Third, Malaysia also pays a higher IP transit prices than is the case in other countries, and this is subsequently passed on to retail consumers of broadband services. Malaysia also performs relatively poorly in terms of the quality of its broadband services. In February 2018, Malaysia’s average download speed was ranked 63rd out of 130 countries, with an average download speed of 22.56 Mbps. This is significantly lower than regional comparators such as Singapore, which ranked in top place (161.53 Mbps) and Republic of Korea, which came in third (129.64 Mbps). Countries at similar levels of economic development as Malaysia also have significantly faster download speeds. For example, Hungary has an average download speed of 90.94 Mbps, while Thailand has an average speed of 41.35 Mbps. Malaysia should look beyond doubling its internet speed and aspire to achieve gigabit-level of connectivity, similar to advanced economies. In the global context, Malaysia’s plans to develop its HSBB and SUBB are unlikely to make Malaysia significantly more competitive, given that many advanced economies are already planning for gigabit networks. 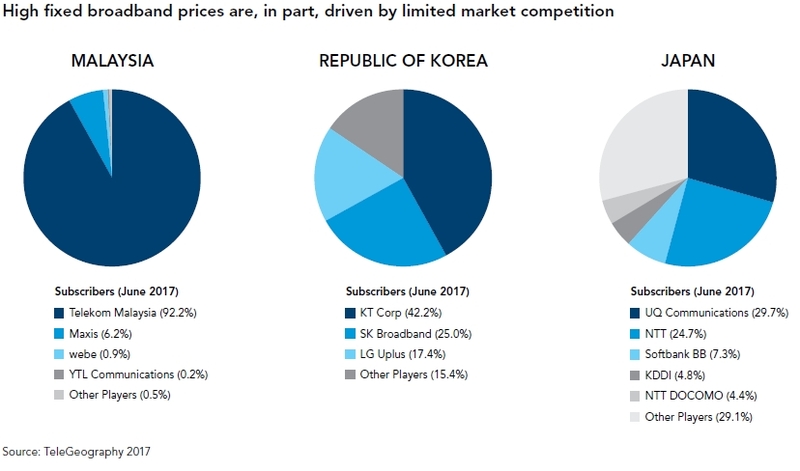 Republic of Korea, for example, has already implemented the Giga-Internet Pilot project, with plans to commercialize 10 Gbps broadband services by 2020, while Sweden aims to provide broadband access at a minimum speed of 1 Gbps by 2025. Regional disparities in terms of both the level of access to broadband services and their quality are also significant. For example, in Kuala Lumpur, the broadband penetration rate stood at 200 percent in Q1 2017. By contrast, the corresponding rate in Sabah stood at 56 percent, significantly below the national average of 104 percent. Similarly, there is also significant disparities in average download speeds, with the lowest speeds in the East Malaysian states of Sabah and Sarawak. With these disparities, Malaysians in different regions have widely varying experiences with digital services, creating disparities in the abilities of people in different regions to seize the opportunities made available by the new technology. At the state level, poorly implemented arrangements for the development of infrastructure may result in increased costs and delays to the rollout of the network. In some states, land planning and use arrangements slow down or increase the costs of network roll out, posing additional challenge to network operators. Many states appoint a thirdparty entity to function as the intermediary between telecommunication providers and local councils. However, these state-backed companies often have exclusive rights to build or manage infrastructure used by telecommunications networks. As a result, states with exclusive partners for network deployment and where telecommunication operators are not free to build networks tend to have lower penetration rate. Moving forward, to improve digital connectivity, Malaysia should consider adopting policies with two main objectives: (i) improving the quality and affordability of fixed broadband services; and (ii) increasing the coverage of ultra-fast broadband networks. To achieve these objectives, the government should consider three broad strategies. First, it should strive to increase the level of competition in the fixed broadband market. In the short term, this could be achieved by enforcing the current regulatory framework to provide all operators with access to cable landing stations. In the medium-term, this could be achieved by opening up the market across all levels of the value chain. Second, the government should strive to attract increased private capital to execute public programs, which would also facilitate the achievement of the first strategy, making the fixed broadband market more competitive. This could include opening programs such as the HSBB and SUBB by implementing a competitive bidding process to involve a wider range of private companies and investors. Third, it should implement measures to expand coverage and to narrow the digital gap between states by ensuring the more effective development of infrastructure deployment through improved planning and coordination with state governments and local councils.